We all know the X-Men, the "Children of the Atom" who risk their lives to protect the humans who hate and fear them. Known most for their inner-team melodrama as much as for their grand adventures, the X-Men have alternately been weirdo outcasts, space-faring superhumans, teleporting renegades, costumed do-gooders, a nation unto themselves and students in a school for the inhumanly gifted and talented. 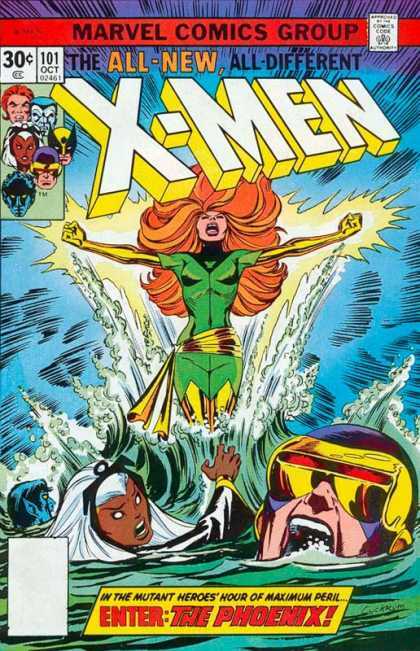 Some of those aspects were present in the first six or seven years of their existence, but it wasn't until the "X-Men" series was cancelled in 1970, then spectacularly resurrected by Len Wein, Chris Claremont, and Dave Cockrum five years later that the X-Men concept started down the path toward the major superhero franchise it would become in the 1980s (and remains, with all of its spin-offs and tie-ins, to this day). As far as X-Men milestones are concerned, everyone tends to focus their attention on "Giant-Size X-Men" #1, with the new, international team of mutants bursting through the cover toward the reader. Even if Chris Claremont didn't come in as writer until the transition back to the regular series with "Uncanny X-Men" #94, that Giant-Size debut is still considered the beginning of the Claremont era. It's when everything really started for the team. But what about "X-Men" #66, the final issue before it turned into an all-reprint series prior to the Wein/Claremont/Cockrum resurrection? Sounds like a perfect choice for another exciting installment of BEFORE THEY WERE FAMOUS, when I take a look at the issue right before a famously memorable run. Last time I wrote about "Saga of the Swamp Thing" #19. "X-Men" #66 makes that comic look like a minor masterpiece. The big problem of "X-Men" #66 isn't the lack of talent from the creative team or that it was the transitional period at the end of the Silver Age when Stan Lee was stepping back from overseeing the entire Marvel line. No, the creative team features Roy Thomas writing and penciller Sal Buscema getting strong inky finishes from Sam Grainger. And Lee was still the Editor-in-Chief for another year or two. And it's not that "X-Men" had never been a good series. It may have been a clunky, goofy series at first, but with Jack Kirby's involvement, it certainly had its muscular power and endearingly oddball cast of characters, like the Brotherhood of Evil Mutants and...um...the Vanisher. Arnold Drake came in to the series in the latter-half of its pre-cancellation run, working with interesting artists like Jim Steranko and Barry Smith (among others), before Roy Thomas stepped in with hot young penciller Neal Adams to craft a handful of issues that were astonishingly good to look at, if extremely hyperbolic and campy in retrospect. But they were fun, certainly, even if one of the major villains of the Thomas/Adams run was a psychic energy leech who looked like a flying dinosaur and named himself, on panel, after the baddie in his favorite J.R.R. Tolkien novel. "X-Men" #66 isn't as good as any of that. It's certainly worthy of its non-reputation as a comic nobody ever seems to want to bother talking about. Is that going to stop me? Of course not! Celebrating just-before-goodness comics is what this now-recurring "Before They Were Famous" feature is all about! Professor X -- who returned from the dead a mere one issue earlier (in a story guest-written by Denny O'Neil) -- lies in a coma, a mere step away from death yet again after channeling the power of human optimism to save the world from an alien invasion. Roy Thomas has Cyclops use the word balloon hammer to drive the twisted nail home in his declaration on issue #66's opening page: "It would be the GRIMMEST irony of all, if he had RETURNED to us after so many long months -- only to have his GREATEST triumph also become -- his final one -- !" Presumably, Cyke is talking about Professor X instead of writer Roy Thomas, because this issue is far from his greatest triumph. Though it is his final one. On the X-Men, at least. The rest of the issue involves a cryptic message from the telepathic, yet comatose, Xavier, as he directs the team to "The Hulk!" but doesn't indicate why or what they are supposed to do when they find him. So it's mostly the X-Men -- Cyclops, Angel, Marvel Girl, and the Beast -- chasing after the Hulk and getting punched by him, while the remaining members of the team (Iceman, Havok, and Polaris), stay back to guard the unconscious Professor X. The X-Men, and the U.S. military, fight the Hulk for page after page, and only win when Marvel Girl applies "mental pressure" and forces him to fall backwards and turn into Bruce Banner. It feels completely like an inventory issue, with its non-regular artistic team and excessive Hulk punching, except for the framing sequence which ties the whole thing back to Professor X's recent return and near-death state. But it could easily have been planned to fit in between some earlier pair of issues, which would explain why new members like Havok and Polaris stayed out of the way for most of the story. It doesn't really matter. The story is junk either way, with a deus ex machina of sorts as it turns out that Bruce Banner had been working on an experimental gamma ray device to treat "mental exhaustion," and once the X-gang zaps Professor X with its sweet green energy juices, their fearless leader pops back from near-death in an instant. I suppose it's not technically a deus ex machina because the Professor did lead the team to the Hulk, and Bruce Banner, with his cryptic psychic cry, but come on! A "mental exhaustion" cure, powered by gamma rays? That's really what Banner had been working on all of a sudden? Well, it's in a comic, so it must be true. Yes, it's hard to imagine that this (and the previous issue) weren't just inventory issues burned off before the series official cancellation. I am going to assume that's the case until Roy Thomas or Stan Lee stop by and correct my guesstimation. Besides its throwaway, Hulk-centric nature, what else makes "X-Men" #66 such an obvious nadir of quality in contrast to what Wein and Claremont and Cockrum (and later, John Byrne and Paul Smith and John Romita, Jr.) would do on the series? It's not the lack of conflict within the team, because that's present here, with Havok and Iceman lashing out at each other like dueling schoolyard bullies in the opening scene. It's not the lack of action, because this comic is almost all Angel-flyin', Cyclops concussion-blastin', Beast-leapin', Hulk-smashin' action. Part of it is the costumes. Cyclops wears his classic blue and yellow garb here, and that never goes out of style (even when Jim Lee tries to add pouches and a haircut), and Angel's white-and-blue looks about as good here as it does anywhere ever, but this is the pre-furry Beast, and he just looks dorky in his red vest and blue mask, and Marvel Girl's green mini-dress doesn't quite work as a superhero costume with that absurdly pointy yellow Catwoman mask thing she sports. When Dave Cockrum comes in, with the All-New, All-Different X-Men like Nightcrawler and Storm and Colossus and Thunderbird, he designs some pretty amazing costumes. And, of course, we all know what eventually happens to Marvel Girl >under Cockrum's sartorial watch. It's not just the costumes that make "X-Men" #66 fall flat though -- or make even the preceding few years of the series less interesting than what comes after "Giant-Size" #1 -- it's the flavor of the dialogue and the characterizations. Chris Claremont can hardly be accused of subtlety in his X-Men run, but compared to the Roy Thomas (and Arnold Drake and Stan Lee) issues, he's an amazingly graceful storyteller. The shift from pre-Giant-Size to post-Giant-Size hinges on the shift from a carnival-barker kind of theatrics to a more comfortable, living-room style "Star Trek" soap opera mindset. It's emblematic of the shift from the Silver Age to the Bronze Age and into the Modern Age, and that transition is not only reflected in Claremont's X-Men, but it's in no small part caused by it. Wein and Cockrum brought in an international, visually interesting, cast of characters. Claremont played them straight. Or as straight as someone influenced by Gene Rodenberry and J.R.R Tolkien could. He tapped into a slightly older audience ready to take its flawed heroes seriously. And that made all the difference. As the final yellow caption box in the letters page of issue #66 says (attributed to "Stan, Roy, and Neal"), regarding the X-Men: "Shed no tears for them, friends; they'll be around."